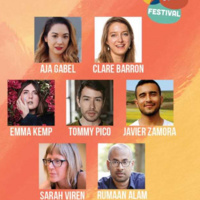 The 7th Annual New Voices Festival, a celebration of emerging writers, is taking place Wed., April 17th to Fri, April 19th. Writing Through Walls: Whose stories are ours to tell? This panel will be moderated by Professor Vinita Prabhakar and will feature writers: Sarah Viren, Rumaan Alam, Javier Zamora, and Emma Kemp. Empty Nesters: What is our relationship to our work after it's published? This panel will be moderated by Professor Catherine Taylor and will feature writers: Aja Gabel, Tommy Pico, Emma Kemp, and Clare Barron. A staged reading of Clare Barron's Dance Nation performed by On the Verge.